Let me get this out up front: I don’t typically write posts tied to a cultural event. Not that I have a problem with it, but I rarely feel as though my perspective on a specific social or cultural moment matters. And that is particularly true when it comes to the somber events we remembered on Sunday. 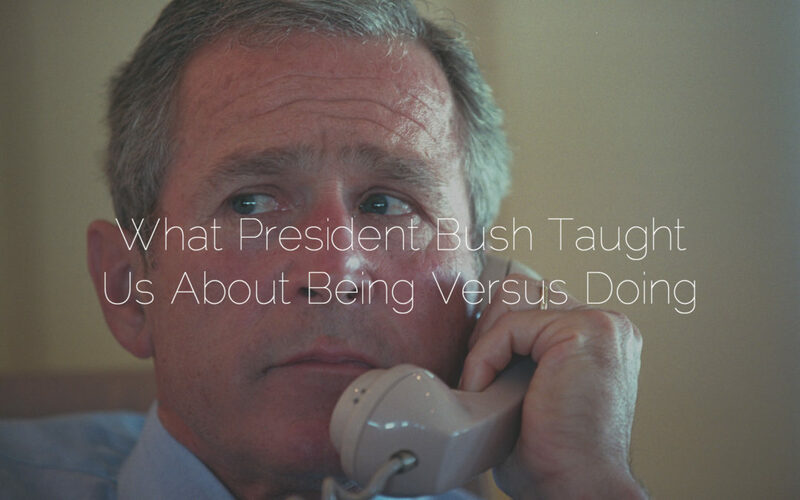 But after reading a fascinating article on the story following President Bush on that fateful day, I wanted to share what I learned. Then she turned on the TV just in time for the 2nd plane to hit. To say the rest of the school day was weird was an understatement. My hometown is located between a nuclear plant and the main Army helicopter training base, so rumors were flying that we could be attacked. As the chaos unfolded on the news for the following days, weeks, and months after that morning, few knew what to think about that day. It seems as though hundreds of thousands of stories have been told about that morning, from survivors to first responders to government officials on the inside. Maybe you’ve even seen documentaries about that day or read the 9/11 Commission report. But over the weekend, I read (like many of you likely did) the retelling of what happened around President Bush that morning. It was a fascinating glimpse into what happened to the man who started his day reading to school children, and ended his day addressing an anxious nation and a watching world. What struck me the most in that story was how the president found out the second plane struck the second tower. He was reading a book in front of a roomful of elementary school kids. Not the greatest place to discover your nation is under an unprecedented attack. And certainly not a great audience to witness the president’s response to such horrific news. Pictures from that moment tell us more about President Bush than perhaps any biography could ever convey. There, in a room of students, teachers, and administrators who are thrilled to be near the President of the United States, someone whispers that America is under attack. Let the weight of that sink in for a moment. While none of us has gotten news quite like that, we all have received difficult news. Whether a difficult diagnosis or the passing of a loved one, we all have moments we don’t wish to relive. A photographer happened to capture the moment when President Bush finds out what is happening in New York. What happened in that moment, as well as the following moments, are incredibly insightful into President Bush the man: he doesn’t let his face convey much, he finishes his commitment, heads back to Air Force One, and gets to work. He doesn’t appear dramatic, alarmist, nor frantic; instead, he’s calm, patient, and composed. It’s as if he knows exactly how to carry himself in front of a hurting nation. Why? Because his sense of being drove what he should be doing. Let pause here to address something: my thoughts here are not about a political agenda. Regardless of your approval or disdain for the Bush’s presidency, this moment forces you to put those feelings on hold and think much larger than political ideology. What the world needed in that moment was not a strong Republican nor a strong Democrat. Instead, the world needed someone of confident character and strong convictions. The world needed someone empathetic, gracious, and human. They didn’t need someone loud, dramatic, and rude. Yes, action is incredibly important. We often remember the things we do-or don’t do-in life. When we propose to our girlfriends, we later wonder what else we could have done to make it more special. When we get into a tense conversation at a work meeting, we later wonder what else we should have said. And when we get a ticket for speeding, we wonder if should have driven a little slower. We remember our actions most in those moments, but we forget our character is what led us to those actions. As we encounter situations in life, whether good or bad, our response happens because of who we are. Think of it this way: Navy SEALS are the most highly trained combat soldiers in the world. In order to carry the title SEAL, they must go through intense, thorough training that prepares them to do everything necessary to succeed. Yes, SEALs are trained to do, but this comes from who they are: tough, strong, committed, determined, focused. These character traits enable them to do what they’ve been trained to do. In our fast-paced world, it is too easy to place more focus on action. There is constant pressure to do in today’s world, whether it’s engaging online or producing more results at work. We focus less on who are we, and focus more on what we do. Or put another way: we are a human doing, not a human being. If we are to be effective in difficult moments or lead well in tough situations, we need to focus daily on building who we are. Our sense of being needs to be deeper than our focus on doing. This sense of being is our character, that inner set of beliefs and convictions that anchor our actions. Without this anchor, we are likely to drift aimlessly and without purpose. But with this anchor, we can have confidence in our doing because we’ve focused on our being. And if we want to be a positive influence, we must focus first on building who we are. The challenge is finding the courage and the discipline to say no. Be willing to push pause on doing so you can focus on your own development. One day you’ll realize the grand important of a well-developed sense of being.